A warm blob of water, a bloom of toxic algae, unexpected sightings of ocean life, and an El Niño have left UC Santa Cruz researchers wondering what the future holds for North America’s west coast and its marine ecosystem. Mark Carr excitedly skimmed through email in his UC Santa Cruz office. “The divers just found a really weird urchin off Cannery Row, and it’s called…,” he trailed off, trying to recall the name. His colleague Pete Raimondi walked in and rattled off a few unusual urchin species that had shown up in Monterey Bay the past year. Turns out it was Arbacia stellata—an urchin found mainly in the Gulf of California in Baja, Mexico. A few were seen as far north as the Channel Islands during the 1997–98 El Niño. That odd arrival in Monterey Bay was just the tip of the proverbial iceberg. Many species of warm-water predators and their prey moved farther north and closer to the coast during the past 18 months, including ocean sunfish and skipjack tuna seen off Alaska; sub-tropical fish such as marlin and blue-fin tuna and a pod of rare pygmy killer whales just off southern California; tropical sea snakes that washed up on southern California beaches; a green sea turtle typically found in Mexico that floated into San Francisco Bay and up the San Joaquin River; and porcupine fish and a fine-scaled triggerfish spotted in Monterey Bay, which turned tropical blue in August from a rare bloom of single-celled algae called coccolithophores. Carr and Raimondi, both professors of ecology and evolutionary biology who have been studying ocean life along the West Coast for the past 25 years, say they have been seeing things they’ve never seen before. Carr, for example, was surprised to encounter large numbers of juvenile California sheephead and kelp bass in the kelp forests off Carmel and Monterey. Small numbers of sheephead adults had been spotted this far north after El Niños, he explains, but a whole school of baby sheephead meant many survived as larvae carried northward by ocean currents for hundreds of miles. Early life stages of other marine critters, including pink sea slugs, spiny lobster, and red pelagic crabs, also floated far north of their normal ranges. Many of these unusual visitors last appeared during the 1997–98 or 1982–83 El Niños. 2015 was a remarkable year, to say the least, for ocean life along the west coast of North America. Unprecedented warm water formed a corridor for marine organisms, big and small, to head north. It also led to perfect conditions for a massive bloom of toxic algae, creating a toxic buffet that traveled up the food chain and eventually shut down valuable fisheries and triggered national attention. Now, the third-largest El Niño on record is adding yet another variable to the mix. For researchers like Carr and Raimondi, armed with 25 years of data, it’s still impossible to make sense of these bizarre conditions. Will they be a footnote? Or are they a harbinger of a drastically different ocean? It all began in the fall of 2013, when an abnormal weather system—an unmoving ridge of high pressure—formed off the Pacific Northwest coast. It shut down ocean-stirring winds and slowed the exchange of heat between the atmosphere and the ocean, a process that regulates the Earth’s climate. This weather system, farther north than usual, spun out winds that pushed cold weather to the East Coast and left California bone dry. It also created a “blob” of warm water in the Gulf of Alaska. In spring of 2014, the ocean rapidly warmed off Baja and Southern California due to persistently weak winds, says NOAA climate researcher Nate Mantua. By fall of 2014, after another shift in wind patterns, the warm patches had all merged. The unusually warm water (5 to 10 degrees Fahrenheit higher than normal in some places) dampened conditions for microscopic algae to grow, but Monterey Bay was a region rife with life. Normally in the spring and summer on the West Coast, wind-driven upwelling brings to the surface cold, nutrient-rich water from deep in the ocean, spurring the growth of algae that form the base of the food chain. In 2014 and 2015, however, unusually weak winds meant upwelling happened mainly in Northern California and farther north. Monterey Bay had enough nutrient input to maintain phytoplankton blooms with help from its deep-water canyon, according to UCSC research biologist Baldo Marinovic. “Monterey Bay is a refuge in hard times because we have deeper water close by,” Marinovic says. But upwelling occurred only within a narrow band close to shore. This coastal strip of productivity meant abundant and spectacularly close encounters with whales, sea lions, dolphins, and sharks while they foraged. That activity was great for the tourist boats, but it turned out to be bad for the animals. The downside to food being concentrated near the coast was that the animals munching on the phytoplankton, or munching on animals that eat the phytoplankton, also ingested mouthfuls of a neurotoxin called domoic acid. The strange oceanographic conditions in 2015 had spurred the worst year on record of a domoic acid outbreak, right after 2014 had already broken records. 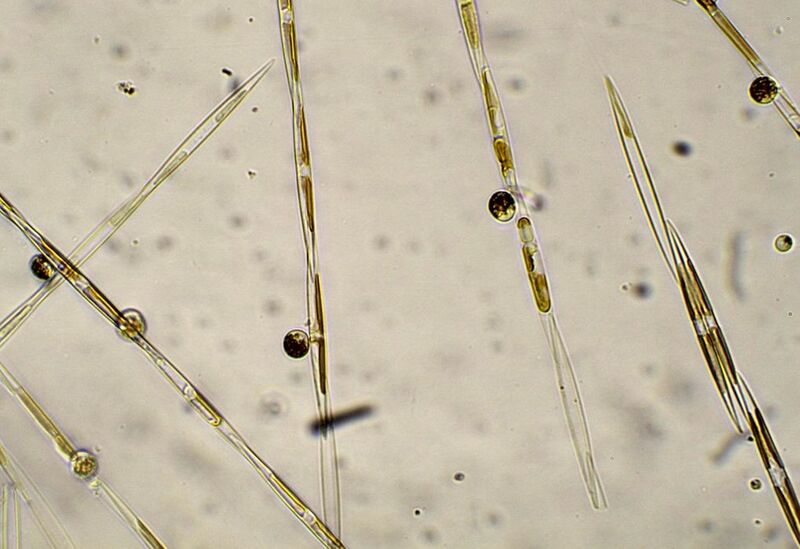 Silica rods of microscopic algae called Pseudo-nitzschia produce domoic acid when stressed by, say, the temperature changing. Blooms of these algae normally last just a few weeks in early spring and autumn. 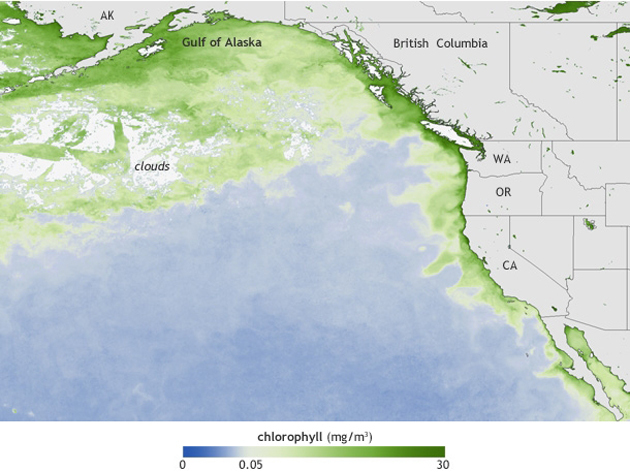 In 2015, however, rather than tapering off, the algae remained for months and at levels never seen before—from Southern California to Alaska. UC Santa Cruz researchers are developing models to predict toxic algae blooms along the West Coast. In 2018, the forecasts will be part of updates provided by the National Weather Service and the National Ocean Service. The algae are not the problem; the issue is when they produce the potentially fatal neurotoxin. Consuming this toxin can cause amnesic shellfish poisoning, which overexcites the nervous systems of vertebrates and assaults the memory center of the brain (the hippocampus), leading to seizures and disorientation. Toxins—compounded with nutritional deficiencies due to reduced availability of prey (also linked to the warm water)—led to record numbers of seabird and sea lion strandings and deaths. Additionally, the unprecedented fishery closures—including Dungeness and rock crab, anchovy, oyster, razor clams, and mussels—meant many fishing communities took major hits to the economic punching bag. This scientific, economic, and health problem caught the attention of government officials, and monitoring this harmful algal bloom became a priority. For the first time, scientists found domoic acid not only in the guts, but also in the meat of commercial fish and crabs. Animals can typically flush the toxin through their systems in 24 hours, but the prolonged exposure allowed it to seep into their flesh. Levels in crabs were still too high in early December, when the California crab season normally opens. Although algae populations were dwindling, the toxicity endured because the algae fell to the seafloor where crabs scavenge, explains Kudela. The toxin doesn’t hurt the crabs, but they continuously accumulate it as they feed. Kudela’s team sampled seafloor sediments and invertebrates and found that regardless of which invertebrates were analyzed for domoic acid, the results came back 10 times higher than toxin levels in the sediment. Crab season finally opened in Oregon the first week of January, but in California, commercial fishing for Dungeness crab was still closed in mid-February. There was a big domoic acid bloom in 2014, notes Kudela, and in 2015 the whole west coast was affected. “If we go into 2016 and it’s another year like this, then we are talking about restructuring the way the ocean is working,” he says. Adding to this jumble of anomalous winds, ocean warming, harmful algal blooms, and atmospheric weirdness, is the 2015-2016 El Niño—one of the three strongest on record. During El Niño, warm, tropical water that’s usually held up against the Indonesian coast sloshes over to the other side of the ocean off South America after trade winds back off or reverse. This irregular weather pattern doesn’t just affect countries bordering one ocean, but influences the entire planet. Thus far in 2015, El Niño has already been linked to outlandish weather around the globe: record-breaking warmth on the East Coast and at the North Pole, tornadoes and floods in the southern United States, and drought and fires in Indonesia. Every El Niño is different, and predicting the effects of this one is challenging, though the previous warming of the ocean between Hawaii and the West Coast may add more moisture to storms. Typically an El Niño in California means more frequent and intense storms, higher rainfall, and higher sea levels (because warm water expands). For giant kelp, El Niño’s storm waves and warmer water carrying fewer nutrients is a double whammy: they grow poorly, and the swell hammers them. If climate change forecasts are accurate with respect to storms increasing in frequency and the swell direction changing, says Carr, the growing season for giant kelp will be shortened each year. Kelp forests harbor a host of invertebrates and fish—some commercially important, like sea urchins, lobster, rockfish and lingcod—and generate food for other species. Both Carr and Raimondi emphasize that what happens after an El Niño year is most critical. Kelp forests and other ecosystems can recover from the battering because El Niño and its impacts typically vanish the following year. “If that doesn’t happen with this event, then I think people will really be scratching their heads,” says NOAA’s Mantua. Raimondi notes that in some places marine organisms have disappeared or expanded their ranges, though currently there’s no consensus on whether these events are related to ocean warming or El Niño. For instance, a disease that wiped out sea stars up and down the North American coast hit before the warm water blobs formed. That disease, called sea star wasting syndrome, took out an important urchin predator in Monterey Bay, the sunflower sea star. Purple urchins can decimate kelp forests, and large numbers have popped up recently during some of the team’s survey dives. Paradoxically, warm water is generally bad for echinoderms like urchins, says Raimondi, “So you’d think urchins would be creamed, but they weren’t.” Sea urchins are experiencing die-offs, however, in a few areas off the coast of southern California. So what’s really affecting what? Understanding how diseases and ocean anomalies like ocean warming or acidification are linked to population bursts and disappearances within a very complex environment is anything but straightforward. Trying to unravel that scientific tangle is the raison d’être for Kristy Kroeker, an assistant professor of ecology and evolutionary biology at UC Santa Cruz. “Most research on climate change happens in isolation, because it’s so challenging to tease apart what’s happening in nature and wrap your head around all the different interactions as things change simultaneously,” says Kroeker, who is focusing her research on kelp forests and estuaries. The bottom line is that several unfamiliar scenes are developing along North America’s west coast at the same time that our oceans are changing on a global scale. The fallout could be from one thing, or it could be from a combination; but the more complex the relationship, the harder for science to keep pace. What is considered bizarre conditions now could become more commonplace. And it’s not just ocean life that suffers, but also humans who depend on ocean resources. Whether it hurts the economy, livelihoods, or drinking water, research into understanding the connections, so as to ultimately mitigate the problems, is vital, says Kudela. Last year provided a good snapshot of how a complex marine community reacts to warming water—possibly a “dress rehearsal” for what’s to come, as suggested by Washington State climatologist Nick Bond. After all, excess heat from the atmosphere mixes into the ocean, which is why sea temperatures have been slowly increasing for well over a century. Thus, the looming mystery is what long-term warming of our oceans will do to marine ecosystems. According to Carr and Raimondi, if a scenario of local ocean warming persists, many species will shift their ranges north, and Central California will start to look more like Southern California. But then again, scientists have never seen a confluence of so many events occurring simultaneously, so what will happen along the West Coast is really anyone’s guess. Rising Seas are about to become a bigger issue for the West Coast, according to scientists. Using satellite and other data, NASA scientists have been tracking rising sea levels around the world. They say that natural cycles in the Pacific have been masking effects of sea rise for about the last 20 years. But that’s changing. “In the next five or ten years, I think the west coast of the United States is going to catch up,” says Josh Willis, a climate scientist at NASA’s Jet Propulsion Lab in Pasadena. He says a major ocean phase known as the Pacific Decadal Oscillation is in the midst of a big shift. For about the past two decades, the PDO, which Willis describes as “El Niño’s bigger, slower, brother,” was “piling up” warmer water on the far side of the ocean, exacerbating sea rise there. When water warms, it expands. “So we’ve actually seen a slight drop in sea levels off of our coastline because of the rearrangement of heat within the oceans,” Willis explains. That rearrangement could mean an acceleration in the rate that seas rise long the West Coast, eventually overtaking the pace of sea level rise on the East Coast and elsewhere. As KQED and San Francisco Public Press have reported recently, billions in shoreline development in the Bay Area are in the planning stages or already begun, despite scientists’ warnings about rising seas. Scientists say the brewing El Niño will also pile up warm water along California, making coastal flooding that much more likely, very soon. The warm water along the Equator that largely defines El Niño is expected to rival or surpass the legendary “Godzilla” El Niño of 1997-98 in strength. NASA says global sea levels have risen about eight inches since the beginning of the 20th century and more than two inches in the last 20 years. Though simple thermal expansion of the water accounts for about a third of the rise so far, climate scientists expect melting glaciers and ice sheets to play a much larger role in coming years.